This is a fabulous sheet pan pork chop dinner. The meal is easy on the budget and takes just minutes to fix. With potato wedges added to the pan, it's a complete meal. Just add a steamed side vegetable or salad, or add some carrots to the pan, and roast them along with the potatoes. The recipe calls for thick boneless pork chops, but feel free to use bone-in chops or meaty country-style pork ribs. Grease a large rimmed baking sheet or pan, or spray it with nonstick cooking spray. Peel the potatoes—or leave them unpeeled—and cut them into wedges or strips. Put the potatoes in a bowl. Peel the onion, and cut it half. Slice the onion into strips, and add it to the potatoes. Peel and mince the garlic, and add it to the potatoes and onions. Toss the potato mixture with 2 tablespoons of olive oil, and transfer to the baking pan. Bake the vegetables for 10 minutes. Meanwhile, heat the remaining tablespoon of oil in a heavy skillet over medium-high heat. Sprinkle the chops lightly with salt and pepper. When the oil is hot and shimmering, add the pork chops to the pan. Fry for about 4 to 5 minutes, turning to brown both sides. Add the pork chops to the baking pan with the potatoes, and return the pan to the oven. 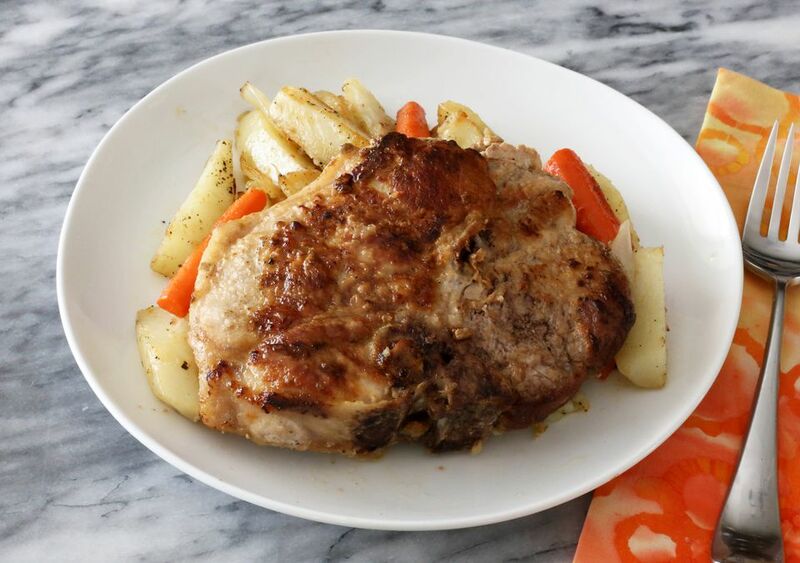 Continue to roast the potatoes with the pork chops for about 20 to 30 minutes, or until the chops reach 145 F on an instant-read thermometer and the vegetables are tender. Just before the pork chops are ready, de-glaze the skillet with the chicken broth, scraping bits off the bottom. Bring to a boil, and continue to cook until reduced by about half; drizzle over the pork chops just before serving. If your Creole seasoning is salt-free, sprinkle the chops and potatoes with some salt along with the seasoning.